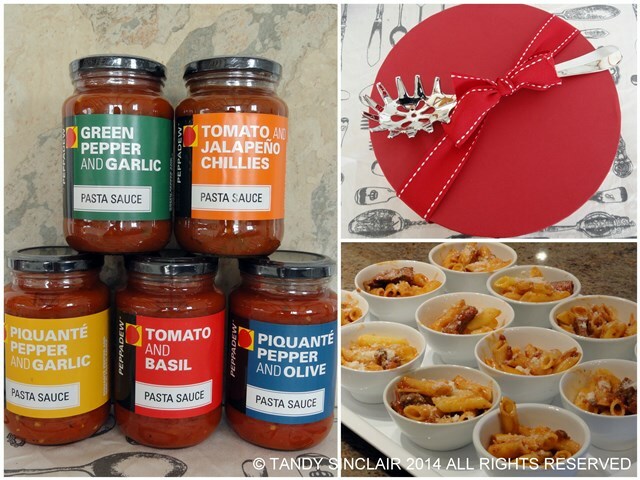 Last week Friday I was out and about at the launch of Peppadew’s new range of pasta sauces. We were shown just how easy the sauces are to prepare – basically open the jar, add to the pan and heat. There are many great advantages to these sauces – they can be used for more than pasta and they can be left in the fridge for 4 days after opening. This is perfect for a 2 person household. After a kitchen demonstration we had lunch on the patio overlooking Camps Bay! I was sent home with a bottle of each sauce and the most stunning spaghetti spoon! Disclosure: I was invited to attend this event. My invitation was not based on me posting about Peppadew Pasta Sauces. This post is in line with my blogging policy. I enjoyed a lot of biltong this weekend as on Saturday I went to order some sausage casings and came home with biltong. Dave went up on Sunday to collect the casings – they weren’t there as promised but he did come home with some more biltong. On Monday I went to collect the casings and yes, I came home with some more biltong. If you live in the Helderberg basin pop down to Mountain Stream Nursery in Gordons Bay and visit Rudi’s for the best biltong around. What a fantastic launch to be invited to, who doesn’t love good sauce?! The quality of the sauce is amazing! I cannot imagine that type of heat! That spaghetti spoon is beautiful! I’m unfamiliar with bitlong. I googled it and if I’m right it is similar to our jerky, a dried meat . Is that correct? That pasta spoon is gorgeous Tandy, the sauces all look good. I am so excited about the spoon! Ooo I would love to try those sauces, especially the one with jalapenos!! I really like how these sauces can be left in the fridge for up to 4 days and are still usable. I hate wasting stuff! Or when I find a bottle of moldy sauce in the back of the fridge!! I had to google what biltong was…ah! got it! I use pasta sauces often when camping. Nice spoon! Don’t think I have ever used a pasta sauce from a bottle before. Your spoon is gorgeous. Have a wonderful weekend Tandy.